You have never experienced darkness until you come to Africa. With very little electricity, when the sun goes down, darkness is thick. There are times even standing outside under the moon you cannot see your hand in front of your face. I often joke with my guard out in Bukeleba that I don’t even know why he guards me because he couldn’t see anything coming at us until it has already attacked us. I am convinced that African’s have cat-like vision and can see at night, unlike us Americans. Tonight as I was driving back into town from the Babies home it was that eerie darkness everywhere. I was amazed though that far in the distance I would see a tiny light and that would be the one candle burning for a family as they gathered in their hut to have dinner. One candle… burning as I would drive by and try to imagine what living this life would be like. I can’t even begin to imagine. Huddled around either a fire or candle in a mud hut, with almost 12 people in the little small space all needing light. Carry your candle, run to the darkness. Seek out the helpless, confused and torn. Hold out your candle for all to see it. Take your candle and go light your world. And in that dark car ride home, on the orange road in the middle of no where in Uganda, I saw a clear picture of a candle in a dark world. I love how the song says RUN to the darkness not walk or tread carefully into the dark. Preparing for this 3 months I treaded carefully and was scared of the darkness, which was the unknown. I definitely did not run at times to get to this dark place. But now after being here, I see the need to run. There is such a fight in the spiritual realm here; babies are being sacrificed to demons because their parents believe they will become rich. Husbands have 4 wives with children that are suffering from a dysfunctional home. HIV runs rampant. Children are dying by the second just because they lack food. Diseases that are easily treated and not terminal at home are taking lives here. It is dark here in Africa. One little flame here though has dozens of people gathered around. It is dark in America too. I can think of many dark places and how we have left other Christians to take the Gospel to the dark places because “some people are called to go and others are just called to support”. Not true. We have all been called to the dark places. We have all been created by God, saved from our sins, and blessed by God to make his glory known in all of the world. Where is your dark place that the Lord is calling you to run to not walk? I think we all have the desire in us to impact the world, if not the world at large but the world around us. That desire is strategically placed by our Creator. As David Platt states, “Regardless of what country we live in, what skills we posses, what kind of education we have, or what kind of salary we make, Jesus has commanded each of us to make disciples, and this is the means by which we will impact the world. Indeed, Jesus has invited us to join with Him in the surprisingly simple journey of spreading the gospel to all nations by spending our lives for the good of others and the glory of God”. A candle loses nothing by lighting another candle. You will lose nothing by taking your candle into the darkness. One candle, one flame can light a forest fire. The eyes have shifted to Uganda through the viral video of Kony2012. People who may have never been challenged to look beyond their home have seen just a tiny fraction of a world across the ocean. The movement has come with mixed reviews. I will just say that capturing Kony will not heal the hearts and lives that have been shattered by his war. The victims will be thankful that he has been stopped, but that does not stop the war going on within their own hearts. We as a ministry have committed to doing just that. We have planned to start 400 churches this year. Now I will be honest, when I heard this, I laughed. 400 churches? How is this possible? But they have a great strategy in place. The 167 churches that we already have established will train people to move out and plant. We started this morning at a new church in Bukolongo, which is a camp for people who have moved from Northern Uganda (where the LRA were) and come to a Sugar Cane plantation to work the fields. There is much devastation and darkness in this particular area. It was so refreshing and freeing to be the church this morning, under a tree, no entertainment, no musical instruments, just a language I couldn’t understand but I a love I knew so well. This is what the Kony2012 movement should be about. Breaking the chains and bringing light into the darkness. She began to weep. As we prayed for the Holy Spirit to break through the darkness and chains, you could feel the evil fighting and leaving. This is all new to me. I know that the war is not against this flesh and blood but against the evil realm but very rarely have I participated in this kind of prayers. As foreign as it might seem, it is real. I saw it with my own eyes today. The devil has many captured in his darkness. But we have come to take the captives and bring them into light and life. Notice it was in his JOY that he went and sold everything he had to buy the field which is the Kingdom of Heaven. Could we really believe that? That it truly is our Joy to leave behind this world, it’s comforts, it’s temporary fulfillment, it’s surface beauty, to give all of it up to gain the Kingdom of Heaven! I have so much fear in losing all I know. But in a world where I don’t know much, with little comforts and resources, I am finding that it truly is just “things and comforts”. He is bending me low, stripping me and I am finding the JOY to go and purchase a field, so I can gain the Kingdom. Picture taken by Dan Harris. I went back to my journal this morning. I went back to just over a month ago when I was preparing to come here to Africa, I was away from my family while my granddad was in the hospital. The same emotions overcame me today as I am away from my family who I love more now than ever, as I learned of my mom’s stroke. Before I came to Africa for my three month stay last summer, I went crazy and got a tattoo. 🙂 I thought long and hard about what I wanted on my wrist for the rest of my life. At that time I had been studying how God had chose me (yes the whole predestination talk) and how if He wouldn’t have pursued me, I would still be in darkness. The word “Chosen” took on much weight in my life. He CHOSE me for salvation, He CHOSE me to come to Uganda. So I decided to get “Yalonze” on my wrist after much research and confirmation from my Ugandan friends. Yalonze was the Lugandan word for “chosen”. Upon my arrival I was showing my Ugandan friends my tattoo and found out that they were wrong and that yalonze actually meant “she chose”. I laughed but not as much as my mom who was not a fan of my tattoo. Today I laugh and know that I for sure was Chosen but I also Chose to say yes. I have chosen no matter the cost to follow. I am so scared at this time. I need Him to help me in my unbelief. I am weak in my flesh. My parents also said Yes to the Call many years ago in surrendering their life to the ministry. There have been great rewards and years of ministry that make it all worth it but they have also seen the hard parts of ministry. That road we are walking today has been a road of difficulties. Questions along the way of “why”? Why hasn’t he opened another door? Why did things end up like this? But in the midst of the “why” He has remained faithful. And I look to my parents as those who say “Yes” every day. They have led the example no matter if no one stands with you, when the road is full of difficulties, when people betray you, when you don’t know where your next paycheck is coming from, when it’s not all fun, you continue to walk in faithfulness. “I will not be moved and I will say of the Lord; You are my strength, my shield, my fortress, deliverer, shelter, strong tower, my very present help in time of need”. Mom, Dad, Raina…thank you for CHOOSING. Jesus, thank you that you CHOSE us. We walk boldly. All for Your Name and Your Glory. Pastors filled the Guesthouse porch. Some have traveled for over a day to come for a meeting. They arrived tired and worn out from the hard travel on either public transportation or on a back of a motorcycle, enduring the bumps and dust. When they arrived they learned instead of a meeting they would be attending the burial of one of their young friends, Pastor Wilbur. Pastor Wilbur, a young man that I met for the first time last summer. He told us of his plans to help all the orphans in his community, reach the Islands for the sake of His name. He pastored one of the most difficult zones, the Islands. He humbly took on the challenges. I hate using the word challenges because we from the Western culture think of our challenges, and not to say we don’t have them, but here the challenges sometimes cannot be painted in words. He was excited about his new twin boys! Pastor Wilbur went to meet the Lord in the hospital from liver failure. I was first amazed by these men who did not complain but made arrangements to travel even further to attend the burial. True apostles. As we got out of our van, we were greeted by soft voices singing and hundreds of people gathered around Pastor Wilbur’s mud home. I was taken aback because not too long ago I was at this same scene, burying my Granddaddy. No matter what culture, grief looks the same. Tears shed, the Gospel preached and hope glistened in the hot sun. My heart broke as I met the wife of Wilbur, she was kneeling and overcome with grief, my knees met hers on the ground as I tried to place myself in her shoes. It isn’t possible. 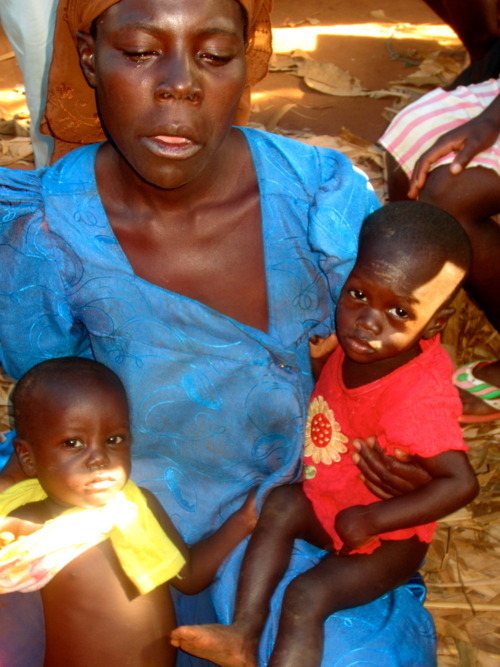 Her children were tugging on her for their own needs of hunger and her older children stood beside her with silent tears. I was honored when they recognized me for coming. I needed no recognition, this is where I was supposed to be, this is my family. How many times do I go back for seconds? How many times have I had extra money in my bank account and I let it sit there for my cushion? My heart was overcome with guilt and conviction. Orphans are easy to love, really they are. People are drawn to help the faces. But now I have a friend and a name to a face that is mom to five children. If we as her church body don’t look after her then we are hurting a family. A widow is who Jesus has commanded, not suggested, we take care of. I could very easily be that widow one day. To sit down and blog brings upon much anxiety. I do not consider myself a writer and I have never wanted to own a blog site. But here I am, my second go at it. Sometimes the words flood from my heart through my fingers other times I have to sit and wait. Today while traveling along this countryside, my thoughts would not slow down enough for me to even put them in ink. There is so much to say…my heart wants to explode with what He has placed upon me, yet I want to take my time. I will begin with my day. My friend Ashley has been working hard to see that Faima, who suffers with Sickle Cell at the age of 6, received the best care possible here in Uganda. She has done an amazing job and we have found the treatment that she would receive in the U.S.! So today we made the journey to Kampala to see the doctor. It is quite the journey…long, bumpy, hot, and scary. The only time I truly fear for my life is in a car in Kampala, because there are no driving rules. I had plenty of time to ride in silence while Faima slept with my mind jumping from one thing to another depending on what my eyes were looking at. As we reached one of the largest hospitals in Uganda we needed to go in and do some blood work to take to the specialist. The thought crossed my mind yet again, how did I get here? Sometimes I have to pinch myself. Dacia, a 27 year old banker, walking a little girl into a foreign hospital to take care of her health. He equips the called is spoken over my heart as I enter a mass of people and a distinctive smell. As I walk in I immediately have looks from everyone in the building, as it seems to me. I feel about as out of place as I look not knowing where to go. As I search the hospital it took all of me not to burst out in anger, tears, and not to get sick myself. How can I come from a country with such wealth and health care and this place has maybe a fraction of that? How can anyone from my country come over here and go back home and not want to do everything in their power to change this situation? A little boy with a massive tumor on the side of his face is staring at me with helpless eyes. A woman about to give birth is shrieking in pain. A man who has lost his leg is sitting in the waiting room and more than one person that I care to mention were lifeless and appeared to be near death. All awhile, I had a little 6 year old with a tight grasp on my hand as she took in the same scene I was. We went to wait for the doctor and as we waited in the sickle cell clinic a young mom with a 16 month old came and sat next to me. We started talking and she was telling me that the crying baby in her lap was in crisis and it hurt for her to even be held. She told me about how hard it is to have a children here because you never know when you are going to lose them. At that moment she looked at me and she looked at Faima. I know she thought I had become Faima’s mom and I never wanted my skin to look like hers like I did at that moment. With the sweetest heart she looked at me and said with her eyes what I know so many people think; because I am an American I can afford to make sure my children live. She looked at me like, why? She loves her child just as much as any mom in America. She fights just as hard for her child like the moms in America that makes sure their house is safe guarded and their child sees as least amount of pain possible. We left the clinic and as Faima laid her head in my lap to sleep on the way home, it was another moment that I knew I am where I am supposed to be. Some children have a mom like the one I met at the clinic and others like the one with her head in my lap has no mom to fight for her health. But they both have a Father that knows every hair on their head and loves them with a Holy love. They are safe in His arms and His alone. Mine are just an extension of His. America…where have we gone wrong? Where have I gone wrong? So many times people say, “Dacia, what you are doing is incredible…not many people would do something like what you are doing”…to which I will say this confidently…I am not abnormal or special or a hero. I am just an ordinary girl who loves her home, loves going and getting pampered, who loves fashion, fun nights out with my friends, but one who just said YES to what He asked. Everyone has a YES. That doesn’t mean you will move to Third World Country, but you will be saying yes to the purpose He created you. I can guarantee one thing, it will be out of your comfort zone. If it is anything like what my heart felt today, and I am sure it is, it is worth saying Yes. I pray that on this Sunday you drink deep of His heart and love for you. You will thirst no more. May we all be captivated and devastated with His presence. Praying for all my friends today. Love you all!